LaRae and Alfred Miller. Picture taken 1987. 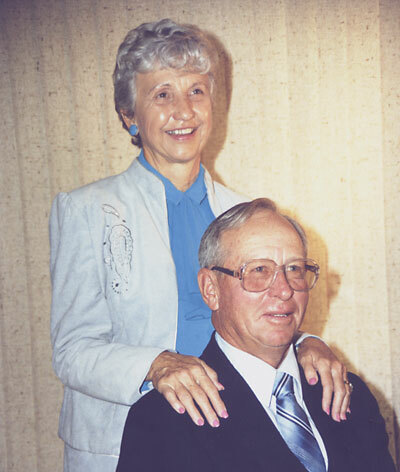 LaRae Morgan Miller, 79, died July 9, 2004 at Banner Churchill Community Hospital in Fallon, Nevada. She was born November 26, 1924 in Idaho Falls, Idaho to Jack and Lucy Morgan. She had lived in Fallon since 1942, coming from Rigby, Idaho, where she grew up and graduated high school. On September 23, 1942 she married Walter "Pal" Rechel. He died in 1977. In 1981 she married Alfred Miller. LaRae was a homemaker and a member of the Church of Jesus Christ of Latter-Day Saints. She was an artist and also belonged to a china-painting club. She is survived by her husband, Alfred, son Darrel (Carrie) Rechel, daughter Darlene (John) Short; sisters Jean Gargiulo, Sharon (Ernie) Beeghly and Dee Ann (Richard) Rowe, all of Fallon, son Dennis (Lucy) Rechel of Yerrington; stepchildren Peggy Miller and Dorothy (Hugo) Blestcher, both of Vacaville, California; Debbie (Clyde) Wayland of Winnemucca; Russel (Diane) Miller of Carson City and Tim Miller of Buffalo, Wyoming.